Thank you for allowing me to address the 14th meeting of the Conference of the Parties to CITES. I am doing this on behalf of Achim Steiner, UNEP's Executive Director, who regrets that he cannot be with you today but plans to join you next week. I would also like to thank our hosts, the Government of the Netherlands and its people for their generosity and warmth. We meet 34 years after the adoption of CITES-three decades marked by a great deal of success in bringing the international community together to tackle the illegal trade in species and wildlife parts. But as we meet in 2007, we know that the work is not over-many existing threats persist and new challenges are unfolding. In two days time, on the edge of the Arctic Circle, Norway will host the main UNEP World Environment Day events under the slogan "Melting Ice-A Hot Topic?" The slogan asks a farmer, a businessman and other individuals whether this is indeed the case-whether melting ice is indeed a hot topic. It also asks a polar bear-if the animal could speak, I am pretty sure his or her answer would be a resounding yes! For this iconic species is facing a bleak, perhaps extinct future if the rise in greenhouse gas emissions and thus the melting of sea ice is not checked. We have seen unprecedented momentum in 2007 on climate change-the challenge of this generation. The science is now 'unequivocal' and the impacts sobering-according to the Intergovernmental Panel on Climate Change sub-Saharan Africa alone may see 25 per cent to 40 per cent of animal species become endangered. Kenya last year earned over $700 million in foreign exchange from tourism-tourism linked with its national parks and nature-based resources. You can only imagine the earnings if many of the animals are gone. The good news from the IPCC is that the economic costs of acting are do-able---perhaps 0.1 per cent of global GDP over 30 years. The challenge now is trust building-making it clear that developed and developing countries are acting, albeit at different speeds, to bring down the rising trajectory of greenhouse gases. Governments will be put to the test on the issue of moving to a post 2012 emissions reductions regime first at the G8+5 in Germany this coming week and at the climate change convention meeting in Bali in December. Ladies and gentlemen, CITES is not responsible for climate change discussions. But decisions taken here do in turn impact on species in a climatically challenged world. For it is clear we will need robust species populations if they are to survive rising temperatures and more extremes. Illegal trade will only diminish and reduce that robustness and survival capacity. We need CITES for other reasons----biodiversity, and the ecosystems it inhabits, are without doubt of central importance in the fight against poverty and in realizing the Millennium Development Goals (MDGs). The Millennium Ecosystem Assessment underlined the state of our ecosystems and by inference species-15 out of 24 ecosystems degraded or unsustainably exploited. At the World Summit on Sustainable Development (WSSD) in 2002, governments agreed to reduce the rate of loss of biodiversity by 2010. Some progress is being made but it is no secret that it is not enough. But ladies and gentlemen, without CITES the situation might be worse and with CITES it can only get better. Biodiversity's importance will undoubtedly grow ever more significant over the coming years and decades. The 20th century was an industrial age-the 21st will be overwhelmingly a biological one. The genetic resources of the world's flora and fauna hold clues to discoveries of new pharmaceuticals, industrial products, biotechnological breakthroughs and crops-- some of which will be vital for coping and adapting to climate change and other challenges. A fair and equitable way of sharing the benefits remains a challenge for other related realms of the multi lateral process. Nevertheless there are other reasons why economic importance is likely to grow even further. Take biomimicry-designing technologies that copy nature. It has been around since the dawn of time, often in an unconscious way. But it is becoming big business-- from glues based on the extraordinary adhesive power of shell fish to bullet-proof vests designed around the super strong webs of spiders. This may sound fanciful-but 56 years ago Georges de Mestral patented his invention which he called Velcro, based on the hooks of the Burdock seeds that would attach to his clothes and his dog's fur when walking in the Alps. 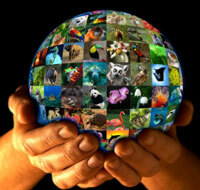 Ladies and gentlemen, CITES remains a central pillar of global biodiversity effort. It is evolving like the species it supports. For example this conference will consider as number of proposals for high-value species from oceans and forests. This underlines the increasing importance countries place on CITES as a mechanism for safeguarding sustainable management of marine and forests fauna. There are some genuine positive developments in the field. The German presidency of the G8 has put biodiversity high on the agenda and may well announce a facility for forests at this coming week's summit. A deep and decisive emission reduction regime could also lead to standing forests coming into the carbon markets. UNEP is committed to supporting CITES and we are delighted that CITES supports UNEP and UNESCO's efforts in areas like the Great Ape Survival Project. Here I must thank the government of the United Kingdom and others for their generous support. The Green Customs initiative is a further, flourishing area of partnership between not only CITES and UNEP but other multilateral environmental agreements-when it comes to customs, the UN is already very much Delivering as One. In the Hague, you will discuss the CITES Strategic Vision to begin in 2008 and to run to 2013. I sincerely hope governments will give it full backing and the resources needed to move forward. I also fully expect the private sector to shoulder their responsibility-- for sustainable management of biodiversity is everyone's common cause and mutual self interest. We live in exciting time full of challenges but also opportunities. CITES remains one of the important answers and a key solution to so many of these as they relate to biodiversity-and as they relate to the now unquestioned relationship biodiversity has to sustainability of our economically important nature-based resources.